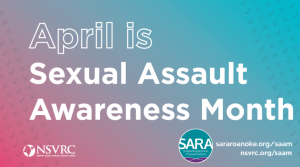 Join us in the City of Roanoke, Noel C. Taylor Municipal North Lobby to kick-off our annual community-wide Sexual Assault Awareness Month Campaign! 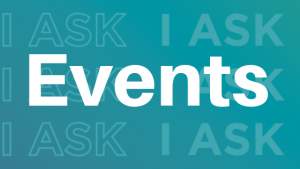 We’ll have information about our #30DaysofSAAM Instagram contest and the numerous community events we have on our SAAM calendar. Mayor Sherman Lea will read a proclamation and Teresa Berry, SARA Executive Director, will provide an organizational update. For media inquiries, please contact Laura Guilliams by calling 540-345-7273 or email: lguilliams@sararoanoke.org. 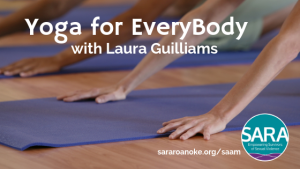 Join Laura Guilliams, RYT-500, for a FREE all-levels gentle yoga class as part of SARA Roanoke’s Sexual Assault Awareness Month events! Register for all four (4) classes and be entered to win one (1) of three (3) yoga kits complete with mat, towel, blocks, belt, and a bag to carry it all! Class space is limited, so participants are encouraged to register in advance. This gentle Hatha yoga series is appropriate for all levels and uses props, modifications, and assists to create a safe, welcoming, and inclusive environment for all participants. Laura will guide the class through a series of postures using the breath and mindful movement to help reduce stress, improve flexibility and strength, and develop more breath awareness. 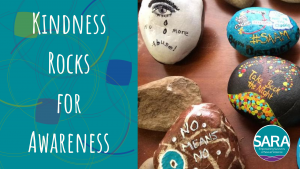 Join SARA Roanoke and the Roanoke Kindness Art Project as we come together to support survivors and raise awareness for sexual violence during April’s Sexual Assault Awareness Month! We’ll be painting rocks to take home, add to the SARA Roanoke garden, or place around town to spread awareness and support! Rocks, paint, ideas, and other materials are provided, but if there’s a special rock or message you’d like to bring, please do! Join Hoot and Holler and SARA Roanoke for this very special night of raw, riveting, and powerful stories of survival and healing. 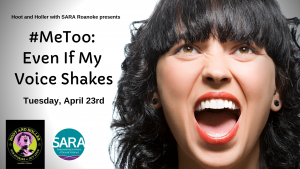 “Even If My Voice Shakes” will invite and celebrate the brave voices of those that have endured the trauma of sexual assault. Will these stories be tough to hear? Yes. Will the very act of telling and/or listening be a profound catalyst for healing and personal growth? Most definitely. Hoot and Holler and SARA Roanoke acknowledge the inherent challenges in speaking about sexual violence, but our goal is that TOGETHER, we can begin the long journey to reclaiming the voice that sexual assault so often steals from us. We hope that you will plan to attend this powerful evening. Proceeds will go directly to SARA Roanoke in support of the beautiful, tireless, and important work that they do in our community. **There will be a food truck on hand for dinner as well as beer/wine and nonalcoholic beverages for sale. Doors open at 5:30 pm! The Ladies of Vision (LOV) Ministry invites you to their 7th Annual Domestic Violence Conference, “The New Me – No More Scars”, on Saturday, April 6, 2019, from 9:00 am to 2:00 pm. The conference will be held at the Pilgrim Family Life Center, 1415 8th Street, NW, Roanoke, VA 24017. Ms. Bianca Holman, News Reporter for WDBJ-7, will serve as Conference Mistress of Ceremony. For additional information or to register, visit www.ladiesofvision.org, call 540-721-1628, or email ladiesofvision@hotmail.com. Registration is also available at the following locations: Chestnut Grove Baptist, First Baptist – Cloverdale, High Street Baptist, Jerusalem Baptist, Morning Star Baptist, Shiloh Baptist Churches, Maple Street Baptist, Roanoke Tribune, and WTOY Radio Station. The registration deadline is March 23, 2019. 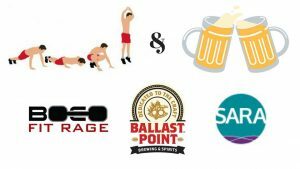 A fundraiser for SARA Roanoke, participants will workout for an hour and then enjoy a beer or water and lunch at Ballast Point: Virginia! The workout will be fun and for ALL levels, but you do NOT have to workout. Watch the shenanigans, make a donation, and enjoy some social time, good beer, and food!